Who is Eligible to Connect? Q. What properties are eligible to connect to the Brookfield sewer network? A. Basically there are only two situations that are eligible to connect to the wastewater handling system. 1) Properties that are in one of two zones – an industrial zone or a Village zone. There are several industrial classifications that are either along the Federal Road corridor or in the Gray’s Bridge, Sand Cut, Vale Road region. Town planners have designated these areas for Industrial development. 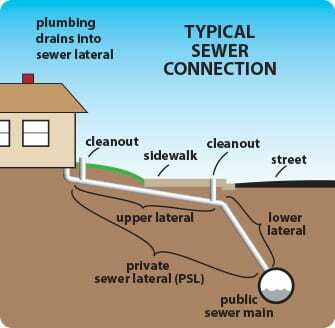 2) if a property is in the proximity of a gravity sewer line AND the septic system is deemed to be in failure by the Town Sanitarian, the WPCA can elect to allow the property to connect. Q. Why is there a limit of who can connect? A. Brookfield has entered into an “Interlocal Agreement” with the town of Danbury to accept an average of 500,000 gallons per day of sewer discharge. This is basically a limited resource. In years 2007 to 2009, the average flow has been about half the permitted level. In fact, flows have decreased slightly since 2007-2009. Presumably this is due to the recent economic down turn that has also impacted Brookfield. See sewer flows presented graphically by year. An increase in flow to Danbury will require a rather significant engineering study and substantial investment in the Publicly Owned Treatment Works (POTW). Conventional wisdom has it that the best interest of the town will be to reserve the available capacity for Commercial, Industrial or Village (Four Corners Area) development. This will allow the tax base to increase to a maximum level to the benefit of home owners.